Combining stunning 4K resolution with smart streaming and a portable design, the ViewSonic X10-4K projector delivers a cinematic experience from anywhere in your home. With a lightweight design, easy carry handle, and short throw lens, this projector is easily moved from room to room, and even outdoors to your backyard. No matter where you watch, images remain vivid and clear thanks to 2,400 LED Lumens of brightness, Rec. 709 compatibility, and crisp Ultra HD 3840 x 2160 resolution. Integrated Wi-Fi connectivity lets you stream from your favourite content providers, while support for both Amazon Alexa and Google Assistant deliver the convenience of voice control. 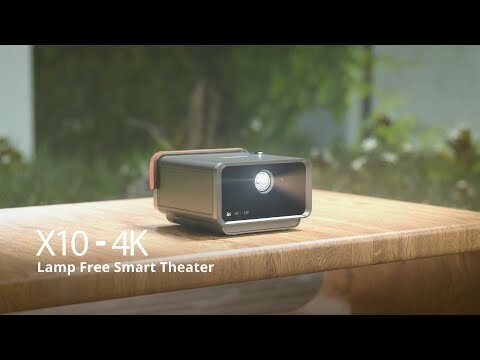 Featuring built-in Harmon Kardon Bluetooth speakers and projecting screen sizes up to 120”, this compact 4K projector delivers an immersive, big-time home entertainment experience. Luxurious leather and metal surface textures combine in perfect harmony on the X10-4K, heralding a new standard for premium home entertainment devices. Enjoy the crisp detail of true 4K Ultra HD with 4x the clarity of Full HD. With 8.3 million pixels projected on your screen, all 4K movies, games, sports, and streaming contents come to life in amazingly sharp detail. In addition, the X10-4K's power consumption is only 35% of a 4K UHD TV, which is more eco-friendly and cost efficient. Featuring 2,400 LED Lumens*, the lamp-free X10-4K can project brilliant images without blur for up to 30,000 hours of usage – a significant upgrade when compared to a traditional lamp-based projector - and it’s mercury-free! Adopting the 2nd Generation LED Technology, the X10-4K integrates red, green, and double blue LED light sources, which efficiently enhance luminance and colour saturation. *Numbers associated with LED Lumens were calculated from the visual perception of ViewSonic projection experts. LED Lumens is a metric generated by comparing numbers associated with LED-based projection to numbers from lamp-based projection. HDR10 (High Dynamic Range) brings out the maximum possible detail in both the brighter and darker parts of an image for enhanced colour and contrast ratios, and a better overall viewing experience. Play any Blue-ray 3D* contents on the X10-4K! Just sit back, relax, and enjoy immersive entertainment in style. With Cinema SuperColor+ technology reaching over 125% of Rec.709 wide colour range, the X10-4K brings cinematic colours and a theatre-like experience to your home. Say goodbye to cable clutter and external devices. The X10-4K is equipped with Aptoide, an app center for all your entertainment needs. Enjoy your favorite apps from the projector to the big screen or download them – all via Wi-Fi. * The Apps herein are for demo purpose only and are not preinstalled in the Product. The Apps and their trademarks or logos are the properties of their respective owners, unaffiliated with ViewSonic, and not sponsors or endorsers of the Product. Intuitive and user-friendly interface design allows you to easily select a command or add a favorite application to the menu. The X10-4K incorporates the latest voice activation services in the market today. Control your projector with your voice via Amazon Alexa & Google Assistant, a smart way to live - all under your command. Dual integrated speakers by Harman Kardon deliver vibrant and powerful sound for an all-around immersive experience whether you’re watching movies, music videos, or listening to a live concert. The X10-4K also serves as a Bluetooth speaker - just connect your smartphone via Bluetooth and indulge in acoustic heaven. Optimised Movie Mode, fine-tuned by Harman Kardon, delivers astonishing audio quality. An extra custom mode is provided for users' preferred settings. Watch well-proportioned images from any angle with built-in autofocus and auto v keystone. Revolutionise the typical projector start time and turn the projector on and off in an instant, just like you would with a TV. The projector is packed with 4 core processors with 2 GB of memory and 16 GB of storage, this powerful combination makes every operation or video playback a breeze to handle. With the fast Wi-Fi speed of 5Ghz, watch your favourite videos freely or mirror them from your smart phone to your audience*. Project 100-inch images from just 1.77 meters away with a short throw ratio that's great for projecting large images in any space. With this feature you can enjoy big-screen entertainment anywhere in the house. The X10-4K features frame interpolation technology, which reduces motion blur and makes for smooth delivery of moving pictures. User safety and comfort is ViewSonic’s top priority. With a built-in ultrasonic sensor, the Eye Protection* feature automatically cuts power to the projection beam when objects are too close to the lens. *Distances can be adjusted in the settings. The X10-4K’s USB Type-C* connection puts a fun twist on streaming videos by allowing you to project contents directly from your phone or tablet. Ease the worry of projection height with a two-stage adjustment foot to fulfill up to 130% of offset. The X10-4K's optical system uses high quality glass for extra reliability, while providing light penetration at an optimal level with low light dispersion to ensure superior and realistic image quality. With a tri-axis flow fan and a state-of-the-art airflow design to help dissipate heat and reduce noise, noise distraction during movies is no longer a concern. Image Size: 30" - 200"